The Paisley Midwest Parties have been pretty cool so far. The first year the guest was Dez Dickerson, which was awesome. The second year it was Steve Parke, who surprised me by being a great guest. Last year it was Susan Rogers which was absolutely fantastic. So, if you're close enough, it's a Prince weekend in Lexington. Check it out! Have an amazing time everyone!! Cannot make it this year. I 'hope' to make it to the next one! Once again, it was a pretty cool event and a fun time for everyone. Owen Husney was fun. He told his story of Prince and a bit more about the rest of his career. Cbabi Bayoc, the artist that did the Rainbow Children cover, told his Prince story and unveiled his new limited For You print. Mayte, who was in town for one of her Bellydance Classes & Workshop, was there for awhile. They all did the autograph & picture thing. For the 4th year in a row Paisley 5 & Dime put on a can't miss event. Purple Underground was in the house with their cameras and everybody took pictures, so, you can probably find some footage if you look around facebook. If you're close enough for a drive to central Kentucky, I would highly recommend the trip for the 5th Annual event next July! I checked out all the pictures and the videos on Facebook. Really enjoyed that. Hoping to make it out to next years event. I am sure you will try to 'out do' this one! Slight correction, I'm not involved in putting the events on. Eric Rogers of The Paisley 5 & Dime, who is also part of the PRN Alumni, and his wife MsLulu are the hosts. My only involvement is I have attended all 4 events and this year Eric asked me to create some remixes for the event which he included on a CD given out to attendees. But, I can't take any credit for putting these together. That's all Eric and MsLulu. The venue moved from Winchester, KY to Lexington, KY this year and it was held at a bar called Hopcat which is I'm told based out of MPLS. 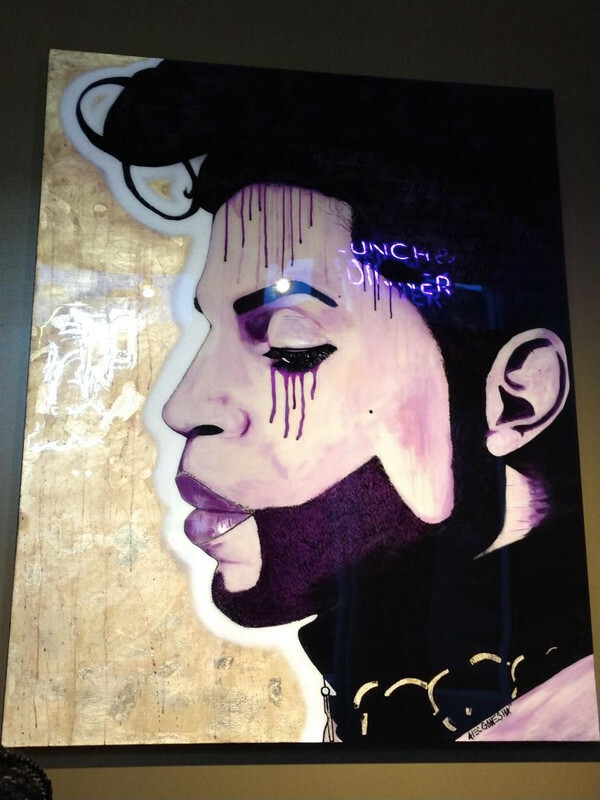 They had cool paintings on the walls of musicians including one of Prince that was done by a bartender at Hopcat who is also a local artist. His painting is amazing, if my wife got a picture I'll see about posting it. Purple Underground were in the house! Thanks DJ Thunderfunk for your Mixes on the CD to make this year's goodie bag. The Paisley 5 & Dime has been around since 1993, and DJ Thunderfunk was one of the first people to be able to partake in the madness that it started way back when, even in the PPML. So, on behalf of TP5&D, MsLulu (my wife).... I would like to thank all of you for your kind words. Maybe we can host some of the members here for parties since we are looking at others host cities. We'll see you on the Purple Highway....Peace. We have been working with Maye for a couple years now. We are proud to have hosted 2 events for her in Kentucky, and even had her as a special guest in Minneapolis before Celebration. She has been one of the most gracious people I've ever met and even in casual chats, she is so keen and attentive. She is really a class act, and it's easy to see why my hero was so madly in love with her. Thank you & MsLulu for another great event and thanks to Owen, Mayte & Cbabi for sharing their time and stories with us! Can't wait for the next one. My vote for a future guest is Duane Tudahl (hint hint).